In this 2010 2010 staff file photo, Brad Swancy deep plows a field to plant white corn at Riverview Farms in Ranger, Ga.
Environmental activists honored a Gordon County, Georgia, farm on Wednesday for protecting a nearby river. 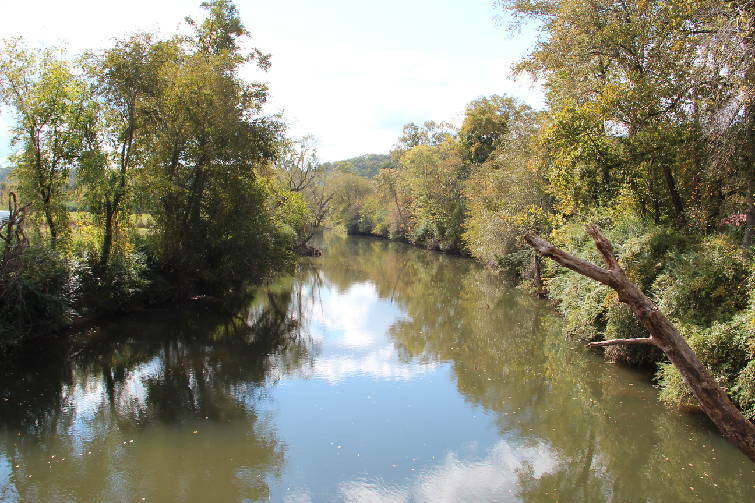 The Georgia Water Coalition, a consortium that aims to protect the state's rivers and streams, named Riverview Farms in its annual "Clean 13" report. The report highlights people in the state observing best practices. At Riverview Farms, located on White Graves Road in Ranger, the Swancy family maintains trees and plants along the Coosawattee River. This growth serves as a natural buffer between the water and the farm's crops and livestock. The family also does not use chemical fertilizers, pesticides or herbicides. "We're pretty excited," Charlotte Swancy said. "To be nominated for something is pretty awesome, especially something for the river that we love." The Coosawattee River in Ellijay, Ga.
Said Joe Cook, advocacy and communication coordinator for the Coosa River Basin Initiative: "The Swancy family at Riverview Farms serves as stewards of the Coosawattee River." Carter Swancy bought the 3,500-acre farm in 1973; he raised hogs and grew corn. By 2000, the farm was on the verge of collapse. Carter's son, Wes, and daughter-in-law, Charlotte, transformed operations. They shrank the scope of the work and now operate on about 300 acres. They also became certified as an organic farm. Riverview Farms now sells directly to consumers, be they restaurants or families who participate in a community-supported agriculture program. As part of the CSA, the farm offers meat once a month and produce every week. This week, Charlotte Swancy said, families received butternut squash, garlic, okra, eggplant and peppers. Next month, the family will open a butcher shop in the Kirkwood neighborhood of Atlanta. The farm sits on the crook of the Coosawattee River, which begins in the North Georgia mountains where the Ellijay and Cartecay rivers meet. The Coosawattee runs 50 miles into the Conasauga River and provides drinking water to residents in Gordon County. On Wednesday, Cook said agriculture businesses such as the Swancys' do not have to abide by some parts of clean water regulations. "On the Coosawattee River in north Georgia, it's not uncommon to see livestock crowded along the banks, drinking from [and defecating in] the river," a member of the Georgia Water Coalition wrote in the "Clean 13" report. The Swancys also participate in Paddle to Farm events with Georgia Organics, the Georgia River Network and the Coosa River Basin Initiative. People paddle the river on a guided tour and stop for lunch at Riverview Farms. "We need to do it more often," Charlotte Swancy said. "They're fun." Contact staff writer Tyler Jett at 423-75706476 or tjett@timesfreepress.com. Follow him on Twitter @LetsJett.